Many international and supranational organisations have lately been busy modernising their internal administration. But nowhere has management change received a similar amount of attention than in the case of the European Commission. Although the perception prevails that the Commission has been losing out in recent years, this vivid interest, academic as well as public, in the so-called Kinnock reform suggests that this organisation still remains "at the heart of the Union". The proposition of this book thus is simple. If it remains true that the Commission is an essential part within the (admittedly complex) equation of EU policy-making, changes of the administration basis of this actor are likely to have broader implications. 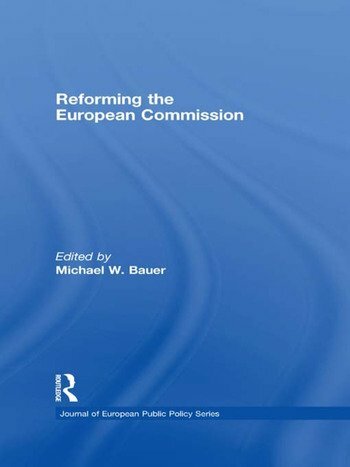 Consequently, this special issue poses three crucial questions about the recent administrative reform of the European Commission: why was such a comprehensive reform possible, what are its specific implications for the Commission as an organisation and what is the likely impact for the policy process? In short, this book puts the organisational base of EU policy-making centre stage. In the quest for answers the authors of the subsequent chapters take distinct perspectives, use various research strategies and methods, and attempt to solve diverse empirical puzzles. But all attempt to add to our understanding of this organisational base, and how to systematically study it. Michael W. Bauer is Assistant Professor for Comparative Public Policy and Administration at the Department of Politics and Management, University of Konstanz, Germany.